One simple word can mean so much. Let’s break down BREATHE letter by letter, shall we? B – “be right back”. That’s right. Say these three simple words and go away for a few minutes by yourself. Take a minute to just BREATHE. Calm down. R – reflect. While you are on your short “be right back” break, reflect on something that makes you calm down like Scripture, or humming a hymn…or even praying. E – enjoy. Yes, while you are taking a breath, enjoy the fact that you CAN breathe and CAN enjoy a quiet moment alone…even if you’re decompressing from something stressful. Enjoy these few minutes by yourself. A – allow. Allow yourself the chance to calm down. Don’t think about what caused you to stress out. It’s OK to take a moment for yourself. You don’t have to be there for everyone, every moment of the day. You, too, need a few minutes of peace to re-gather your focus, re-group, and re-charge. T – trust. Trust that you are exactly where you need to be at this point in time. And, even if you need to take this little opportunity to breathe, just remember that God’s got your back and He won’t leave you stranded. Ever. He promises us that He’ll never leave or forsake us. H – HIM. When I need time to just take a minute to breathe, if I focus on HIM (Jesus) and God’s Word, I am so much calmer. There’s something soothing in God’s Word and His promises that just moves over me and melts my concerns, worries, fears, anger, and/or stress. E – engage. Now that you’ve had time to “be right back” to reflect on something else, and enjoy the solitude that you are allowing, trust in HIM and go back and ENGAGE your family, your team, colleagues, or whatever else you needed a break from. You are now re-charged for whatever lies ahead of you with a clear mind, a soothed soul, and a better frame of mind. 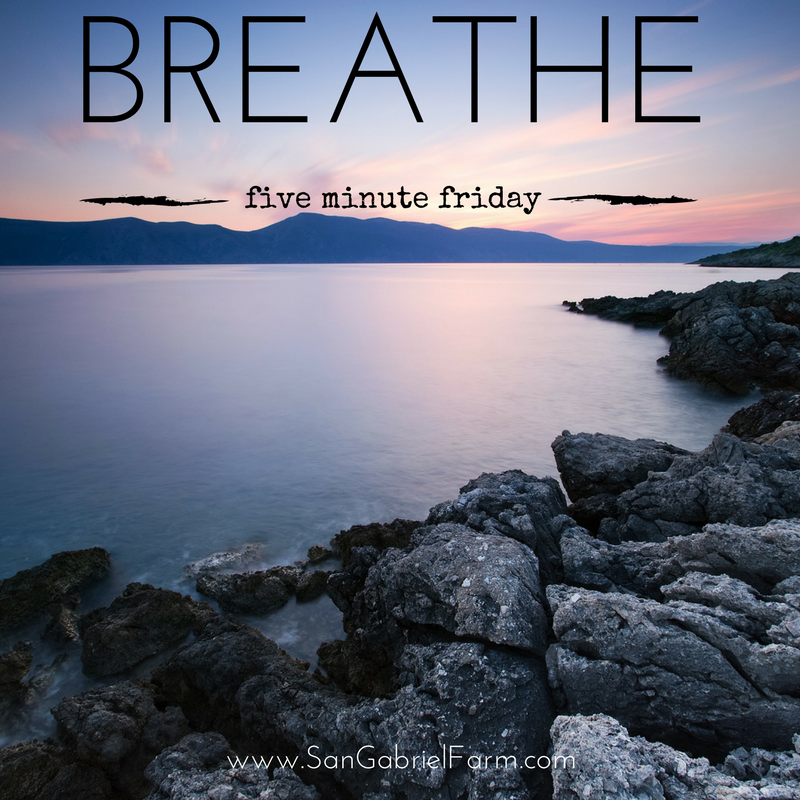 So … now you know what to do when you just need to breathe. Thank you for this wonderful reminder……..trusting this is where I am supposed to be; right now. It can be so difficult at times but then God speaks through beautiful words such as this and we are made beautifully aware……He’s got it!!! Beautiful thoughts and timely reminders!! Thank you, Amy, for these sweet words. God is so good all the time! I sincerely appreciate your stopping by and leaving a comment. Makes my day! Oh this is great! Such wisdom. I’m #11 at the FMF! These are great points! I love how you’ve broken down the word. Thank you!! I appreciate your stopping by and commenting! And then go back in and engage with others …such an encouragement to carry on in God’s plans! Thank you for stopping by! Glad you enjoyed the post today. I thought it was pretty applicable to most of us these days. Seems we’re all burning the candle at both ends.